Under the false premise of celebrating a people's resilience, saccharine-doused romance set against the Armenian genocide is but a poorly crafted piece of American propaganda - don't waste your time and your money! A lot of money, clichés, subliminal messages and very poor filmmaking, that’s probably the best way to sum up the not-so-promising The Promise. This Hollywood production, which cost a nine-figure sum, tries to infuse a little bit of everything in its 122 minutes: the heroism of Mel Gibson’s Braveheart (1995) the colours and the settings of a Disney movie, the adrenaline of Indiana Jones (with train top chase et al), the horrors of Schindler’s List (Steven Spielberg, 1993), the epic journey of Elias Kazan’s America America (Elia Kazan, 1963), and… wait for this… even the “maritime depth” of James Cameron’s Titanic (1997) – I promise you will understand what I mean if you are unfortunate enough to watch this film to the end. The Promise tries to be a little bit of everything, but it turns out to be nothing. Except for a wasted opportunity to remember one of the most murderous events in the history of mankind and to celebrate the resilience of Armenians. 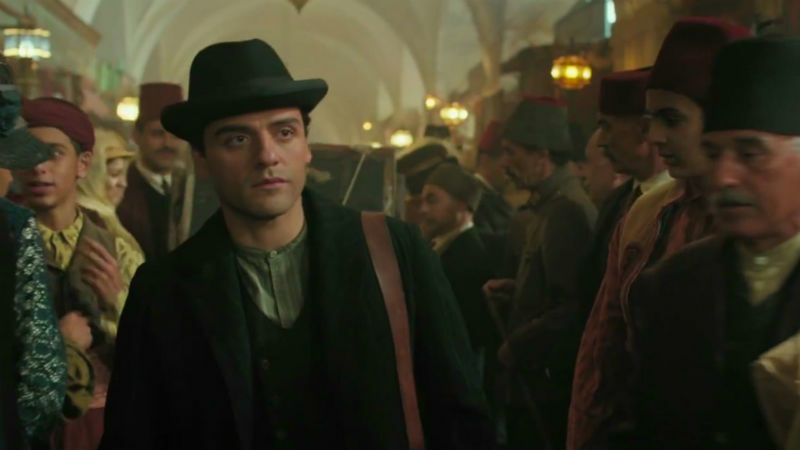 The film, which takes place in 1914-15, tells the story of talented medical student Michael (Oscar Isaac) and the gorgeous dance instructor Ana (Charlotte Le Bon), both of Armenian background. They become enamoured, leaving Ana’s boyfriend Chris Myers (Christian Bale) heartbroken, an American journalist working for associated press. Soon the Turks begin to carry out the systematic decimation of 1.5 million Armenians, rendering Michael’s and Ana’s extremely vulnerable and leaving Chris in a very difficult situation: should he denounce the atrocities to the international press, which could put his very own life at stake? I am not disputing the ruthlessness of the Ottoman Empire and their sheer failure to recognise the Armenian genocide, one of the bloodiest and darkest chapters in recent history. I am simply saying that this film is not a suitable denunciation tool: it is cloaked in vested geopolitical interests and drowned in poor filmmaking. A cinematic damp squib. Guatemalan Oscar Issac is the Armenian protagonist Michael. The film is entirely in English, except for the evil Germans who speak their own language. English with a bizarre supposedly Middle Eastern accent and the occasional broken English phrase is a perfect substitute for the Turkish and the Armenian languages. And casting a Guatemalan (Isaac) to play the Armenian lead is perfectly reasonable: brown people all look the same. The chemistry between the two protagonists is as effervescent as a Coca-Cola left open in your fridge for five days. There are enough glycerin tears to nourish the dry skin of a family of elephants (now you know that glycerin is an excellent skin moisturiser, and it’s a crime against common sense to squander it in ineffective tearjerkers such as The Promise). The dramatic efficacy of the film is close to zero. You will not cry when the children cry, you will not feel a punch in the face when Michael gets punched in the face and you will not even feel uncomfortable when you see the forced labour camps and the piles of Armenian corpses. Is it because the horrors of such as genocide are just too graphic and disturbing for a mainstream audience, and therefore should be toned down and made more digestible? Just think Schindler’s List and you will soon realise that the answer is “no”. There is no reason why The Promise couldn’t have made a bigger attempt at realism. Christian Bale’s character is the portrait of kindness and solidarity. 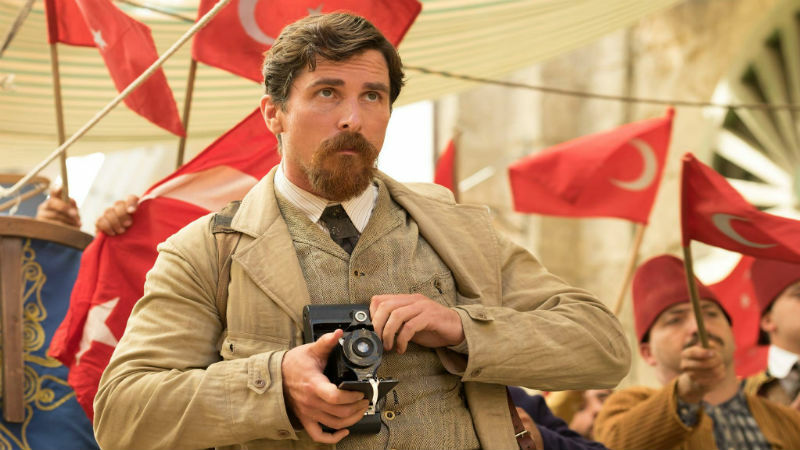 The biggest problem with The Promise, which makes it only the third film in our 15-month history to be given just one-splat (our lowest possible rating), is the fact that the historicity and denunciation become entirely diluted in American propaganda. Michael ultimately dreams of reaching the US, in some sort of twisted American dream. His journey is remarkably similar to Stavros in Elia Kazan’s America America. Even the lead actors (Guatemalan Oscar Isaac and Greek Stathis Giallelis have an uncanny resemblance). Kazan was later accused of McCarthyism and blind American nationalism. Both films are about a foreigner who longs and fights to embrace the US. But it gets worse. The American character is the epitome of altruism. He’s noble, principled and ready to commit the ultimate sacrifice in the name of justice not just once, but as many times as necessary. He will do anything in order to help Armenians. And as we all know, Americans only engage in wars in order to help the oppressed. Those American, their generosity knows no bounds! Yeah, right. Add to that the fact that Christian Bale is a staunch Republican voter and a friend of peace-loving Donald Trump. Oh, there’s also an American Ambassador who help Christian Armenians DESPITE being a Jew. His faith does not interfere with his job, he makes it clear. Wow, isn’t this guy just amazing? Maybe not. The sheer manicheism of this film is simply insulting. The Promise is out in cinemas across the UK, and certainly in a multiplex near you. We recommend that people of all affiliations, nationalities, races, colours and creeds avoid it.